Men’s tennis (15-9) traveled to Clemson on Friday and pulled off a 4-3 win for their third ACC victory this season. The doubles lineup included senior Christopher Morin-Kougoucheff and freshman Fabien Salle at No. 1, senior Federico Gomez and junior Clement Filho at No. 2, and senior Brandon Lancaster and freshman Alex Wesbrooks at the No. 3 spot. Kougoucheff and Salle finished first, defeating 90th ranked Simon Baudry and Yizhou Liu (CU) 6-2. On court three, Lancaster and Wesbrooks fell 6-4 to Teodor Giusca and Carlos Kelaidis (CU). To clinch the doubles point for the Tigers, Pierre-Louis Dodens and Jacob Jahn (CU) took down Filho and Gomez with a score of 6-4. The singles lineup included Kougoucheff at No. 1, Lancaster at No. 2, Sergio Hernandez at No. 3, Salle at No. 4, Gomez at No. 5, and Filho at No. 6. 115th-ranked Kougoucheff was defeated 6-2, 6-3 by Baudry (CU), giving Clemson a two-point lead. 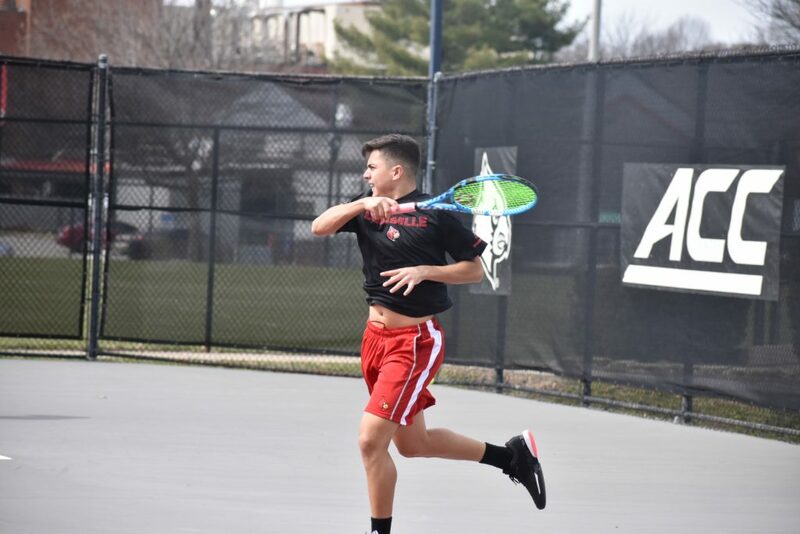 Coming in next for the Cards was Salle with an easy 6-3, 6-3 win over Kelaidis (CU), putting Louisville on the scoreboard. Bringing Louisville another point was Gomez with his victory over Dodens (CU) (6-4, 6-4). To continue the streak, Filho brought down Jahn (CU) 6-4, 7-6 (4), giving Louisville the lead. Lancaster gave Clemson their final point of the match after falling to Liu (CU) 4-6, 6-4, 3-6. To finish off strong, Hernandez clinched the match by defeating Giusca (CU) 7-6, 4-6, 6-3. Men’s tennis travels to Atlanta to take on No. 49 Georgia Tech Sunday, April 7th at noon for their last away match of the season before the ACC Championships.